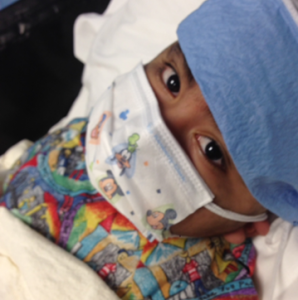 In 2010, Lazaro was born a healthy newborn, but things began to change quickly. Lazaro was getting sick often — he had frequent bouts of pneumonia with very high fevers. After numerous tests the doctors discovered that his red blood cells were not reproducing regularly which was causing his immune system to be weak and therefore making him prone to infections. 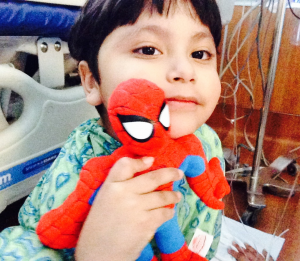 Lazaro’s treatment plan started with infusions, but that wasn’t enough to sustain him so he had to begin chemotherapy. Making their journey from Russellville, Alabama to begin treatment in Birmingham was overwhelming for the family. Their baby boy was sick and they had to make a tough decision to leave their two teenage daughters at home with relatives. They knew there was no way that all five of them could stay in Lazaro’s hospital room. Because this family spoke very limited English, it was especially scary for them as they had a hard time understanding what was being done for their son. After treatment, Lazaro was released to Ronald McDonald House Charities of Alabama, but was instructed to be in total isolation. During the entire four months that his family stayed at the House, he wasn’t allowed to come out of his room unless he was headed straight to the hospital for blood work, testing or follow-up appointments. 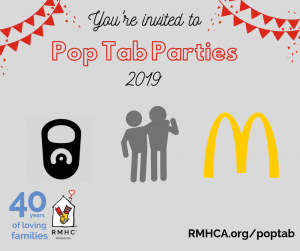 Lazaro’s room at RMHCA had a view of the courtyard and he could see the kids playing on the playground. He often told his parents that he could not wait until he was well enough to come out of his room to play with the other kids and take pictures with the Ronald McDonald statue. He knew that the House often hosted activites, but unfortunately his weak immune system prevented him from participating. The staff and volunteers had been working with Lazaro’s parents, despite the language barrier to find something special to brighten Lazaro’s stay. We knew we would have to deliver the happiness right to his room — but how? Finally, a day came when we knew what we could do. 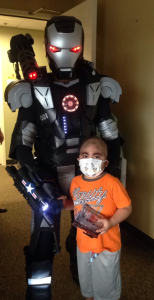 Lazaro heard someone knocking on his door and when he opened it there was a life-size Transformer just waiting to hang out with him. It was at that moment thoughts of his illness were pushed to the background. He was able to be a kid! Thanks to an awesome volunteer, Matthew Wheeler, we were able to brighten Lazaro’s stay with us.